Tom Van Flandern: Was the planet Mercury once a moon of Venus? 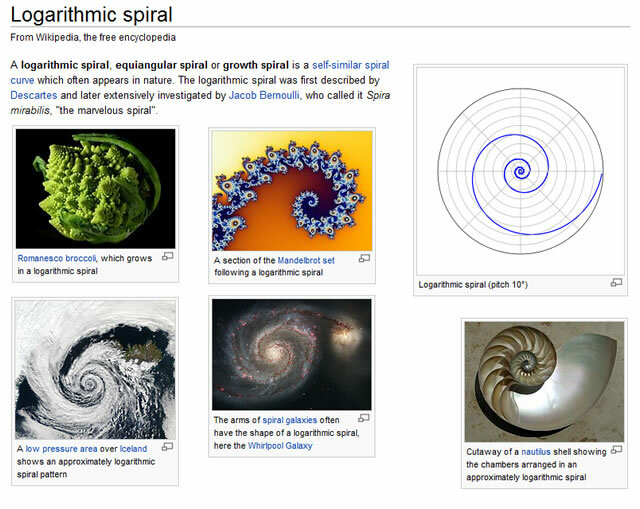 A remarkable discovery: All Solar system periods fit the Fibonacci series and the Golden Ratio. Why Phi? Guest post by Tim Cullen covering natural philosophy from pre-historic Scotland, Plato and Kepler to a sub-atomic theory developed by an eminently well qualified nuclear physicist. The renaissance of Natural Philosophy in the Renaissance period laid the foundation stones which enabled the construction of the modern scientific edifice. The Renaissance also renewed interest in anti-Aristotelian theories of nature considered as an organic, living whole comprehensible independently of theology, as in the work of Nicholas of Cusa, Nicholas Copernicus, Giordano Bruno, Telesius, and Tommaso Campanella. Nicholas of Kues (1401 – 1464), also referred to as Nicolaus Cusanus and Nicholas of Cusa, was a German philosopher, theologian, jurist, and astronomer. One of the first German proponents of Renaissance humanism, he made spiritual and political contributions in European history. A notable example of this is his mystical or spiritual writings on “learned ignorance,” as well as his participation in power struggles between Rome and the German states of the Holy Roman Empire. Nicolaus Copernicus (1473 – 1543) was a Renaissance mathematician and astronomer who formulated a heliocentric model of the universe which placed the Sun, rather than the Earth, at the center. Giordano Bruno (1548 – 1600) was an Italian Dominican friar, philosopher, mathematician, poet and astrologer. His cosmological theories went beyond the Copernican model: while supporting its heliocentrism, he also correctly proposed that the Sun was just another star moving in space, and claimed as well that the universe contained an infinite number of inhabited worlds populated by other intelligent beings. Bernardino Telesio (1509 – 1588) was an Italian philosopher and natural scientist. While his natural theories were later disproven, his emphasis on observation made him the “first of the moderns” who eventually developed the scientific method. The renaissance of Natural Philosophy also marked a revival in mysticism and astrology. Such movements in natural philosophy dovetailed with a revival of interest in occultism, magic, hermeticism, and astrology, which were thought to yield hidden ways of knowing and mastering nature. One Hermetic concept that has echoed down the ages is As Above, So Below. 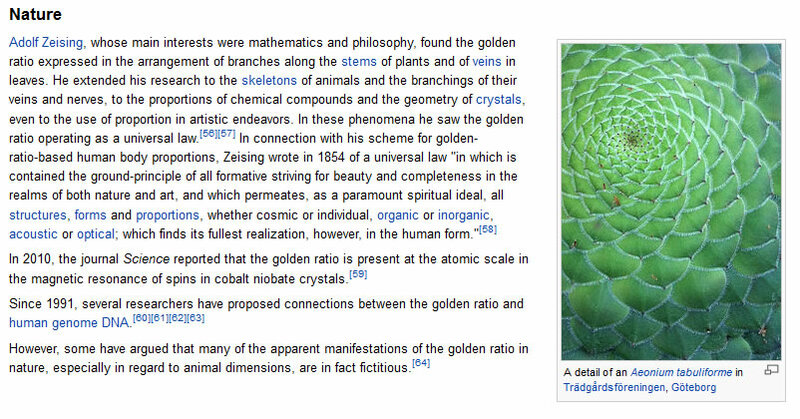 Additionally, the mystical concepts of the Golden Ratio and the Golden Triangle have echoed down the ages. Some of the greatest mathematical minds of all ages, from Pythagoras and Euclid in ancient Greece, through the medieval Italian mathematician Leonardo of Pisa and the Renaissance astronomer Johannes Kepler, to present-day scientific figures such as Oxford physicist Roger Penrose, have spent endless hours over this simple ratio and its properties. But the fascination with the Golden Ratio is not confined just to mathematicians. Biologists, artists, musicians, historians, architects, psychologists, and even mystics have pondered and debated the basis of its ubiquity and appeal. In fact, it is probably fair to say that the Golden Ratio has inspired thinkers of all disciplines like no other number in the history of mathematics. Collectively, these three concepts [As Above, So Below, the Golden Ratio and the Golden Triangle] have formed a golden thread that connects the modern era to the ancient philosophers. Isaac Newton placed great faith in the concept of an unadulterated, pure, ancient doctrine, which he studied vigorously to aid his understanding of the physical world. Many of Newton’s manuscripts – most of which are still unpublished – detail his thorough study of the Corpus Hermeticum, writings said to have been transmitted from ancient times, in which the secrets and techniques of influencing the stars and the forces of nature were revealed. Furthermore, following this golden thread from the Renaissance through the period of Enlightenment and into the Modern Era reveals a unique holistic cosmology that scales from the atomic level through to the galactic level. Chronologically, the early modern era of Western philosophy is usually identified with the 17th and 18th centuries, with the 18th century often being referred to as the Enlightenment. Modern philosophy is distinguished from its predecessors by its increasing independence from traditional authorities such as the Church, academia, and Aristotelianism; a new focus on the foundations of knowledge and metaphysical system-building; and the emergence of modern physics out of natural philosophy. The academic canon of early modern philosophy generally includes Descartes, Spinoza, Leibniz, Locke, Berkeley, Hume, and Kant, though influential contributions to philosophy were made by many thinkers in this period, such as Galileo Galilei, Pierre Gassendi, Blaise Pascal, Nicolas Malebranche, Isaac Newton, Christian Wolff, Montesquieu, Pierre Bayle, Thomas Reid, Jean d’Alembert, and Adam Smith. Shamefully, the truly remarkable Johannes Kepler is excluded from the “academic canon” of Natural Philosophers [from the period of the Enlightenment] listed by Wikipedia. Perhaps this is because, at the tender age of 25, Johannes Kepler published his first major astronomical work [Mysterium Cosmographicum – 1596] that detailed a cosmological theory whereby the five Platonic solids dictate the structure of the universe. Kepler proposed that the distance relationships between the six planets known at that time could be understood in terms of the five Platonic solids, enclosed within a sphere that represented the orbit of Saturn. According to Kepler’s account from this text, the ratio was brought to his attention accidentally while demonstrating the calculation of the ratio between a circle and a circle created by a rotated inscribed circle. 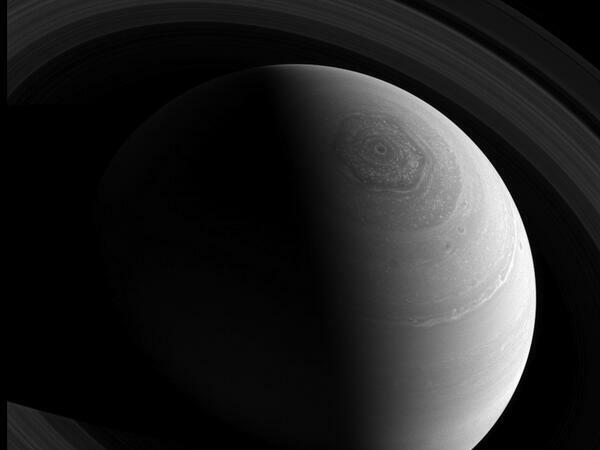 From this he realized that he had stumbled on the same ratio between the orbits of Saturn and Jupiter. He wrote, “By a certain mere accident I chanced to come closer to the actual state of affairs. He found that each of the five Platonic solids could be uniquely inscribed and circumscribed by spherical orbs; nesting these solids, each encased in a sphere, within one another would produce six layers, corresponding to the six known planets – Mercury, Venus, Earth, Mars, Jupiter, and Saturn. By ordering the solids correctly – octahedron, icosahedron, dodecahedron, tetrahedron, cube – Kepler found that the spheres could be placed at intervals corresponding (within the accuracy limits of available astronomical observations) to the relative sizes of each planet’s path, assuming the planets circle the Sun. Kepler also found a formula relating the size of each planet’s orb to the length of its orbital period: from inner to outer planets, the ratio of increase in orbital period is twice the difference in orb radius. Though the details would be modified in light of his later work, Kepler never relinquished the Platonist polyhedral-spherist cosmology of Mysterium Cosmographicum. In Euclidean geometry, a Platonic solid is a regular, convex polyhedron with congruent faces of regular polygons and the same number of faces meeting at each vertex. Five solids meet those criteria, and each is named after its number of faces. The mainstream has [gently] dismissed Kepler’s cosmology as a flawed, esoteric eccentricity. However, Johannes Kepler undoubtedly demonstrated that he was a truly remarkable Natural Philosopher when he combined the theorem of Pythagoras with the Golden Ratio to form the Kepler Triangle and [most importantly] when he proved that the Golden Ratio is the limit of the ratio of consecutive Fibonacci numbers. In this manner, Kepler spectacularly connected the mystical world of the Golden Ratio to geometric patterns that are observed, at all scales, in Nature. Intriguingly, Kepler stellated the regular dodecahedron and documented two regular star polyhedra: the small stellated dodecahedron and great stellated dodecahedron. Louis Poinsot extended this work in 1809 by discovering two additional regular star polyhedra: the great icosahedron and great dodecahedron. Interestingly, Kepler’s interest in regular polyhedra may have been inspired by artefacts that indicate knowledge of the Platonic Solids a millennium before Plato. Hundreds of carved stone spheres, roughly three inches in diameter, believed to date to around 2000 BC, have been found in Scotland. Some are carved with lines corresponding to the edges of regular polyhedra. Roughly half have 6 knobs—like the one at right above—but the others range from three to 160 knobs. The Carved Stone Balls have been taken as evidence of knowledge of the five Platonic solids a millennium before Plato described them. Indeed, some of them exhibit the symmetries of Platonic solids, but the extent of this and how much it depends on mathematical understanding is disputed, as configurations resembling the solids can naturally arise when placing knobs around a sphere. Most, if not all, of the Kepler-Poinsot polyhedra were known of in some form or other before Kepler. 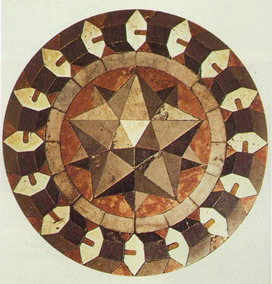 A small stellated dodecahedron appears in a marble tarsia (inlay panel) on the floor of St. Mark’s Basilica, Venice, Italy. It dates from the 15th century and is sometimes attributed to Paolo Uccello. Kepler’s cosmology, after languishing in quiet oblivion for hundreds of years, was revived in the 1980s by Robert James Moon. Arriving at the University of Chicago at the age of 16 in 1928, Moon expressed his intention to solve the problem of controlled thermonuclear fusion. Arthur Compton, then chair of the Physics Department, told him his department was not working on that problem, and sent him to the chairman of the Department of Physical Chemistry, William Draper Harkins. Moon earned a Ph.D. degree in Physical Chemistry under Harkins, and then a doctorate in Physics. He taught in both departments at the University of Chicago, starting in the 1930s. During World War II, he played a key role in the Manhattan Project; he later conducted biophysical research in connection with Argonne National Laboratory. In the 1930s, Moon built the second cyclotron in the world, with many improvements over the first device constructed by E.O. Lawrence. During the Manhattan Project, he solved the problem of the carbon moderator, making the first atomic pile possible. After the war, he constructed the first scanning X-ray microscope, and pioneered in optical biophysics studies on the action potential in nerves. Robert James Moon developed the “Moon Model” where the protons in the naturally occurring elements are “determined by the vertices of two identical pairs of nested [platonic] solids” in much the same way “that Kepler determined the orbits of the planets”. Moon developed a nested model, using the Platonic solids to define the atomic nucleus in much the same way that Kepler determined the orbits of the planets of the solar system. In Moon’s “Keplerian atom,” the 92 protons of the naturally occurring elements are determined by the vertices of two identical pairs of nested solids. 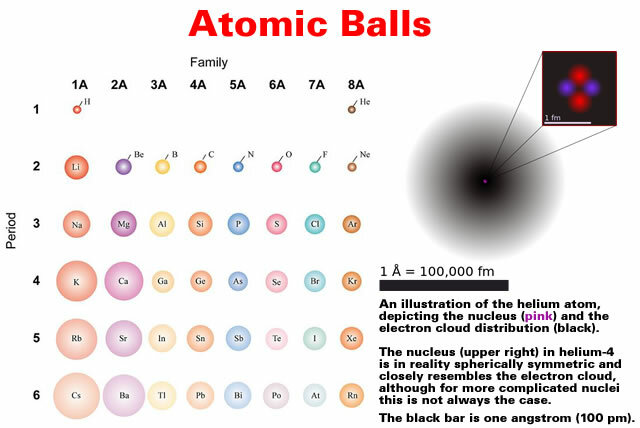 Although an elaborately refined set of rules exists to explain many phenomena observed at the atomic level, there is no satisfactory model of the atomic nucleus, the central core of the atom around which a precise number of negatively charged electrons is presumed to orbit. Any attempt to produce a coherent theory of orbiting electrons, without knowledge of the structure around which these orbits are constructed, would seem to be doomed to failure. Nonetheless, a highly elaborated algebraic theory of the atom, designed to account for a mass of data gathered from spectral analysis and other operations, does exist in the form of the quantum mechanical model. Most of this theory presumes no more about the atomic nucleus than that it contains a certain number of positively charged particles agglomerated in a central mass. It would seem past time to arrive at a more developed theory of the atomic nucleus, and from there to rework the cumbersome and very problematical portrait of the atom that the quantum mechanical model has bequeathed us. University of Chicago physicist Dr. Robert J. Moon has proposed a geometrical model of the nucleus to do just that. Moon has produced a synthetic geometric construction of the periodic table of the elements in such a way as to account geometrically, in a first approximation, for the existence of the 92 naturally occurring elements and many of their physical properties. I have added to Moon’s hypothesis a construction that provides a nonmagical cause for the Magic Number theory (the theory that attempts to account for changes in the nuclear properties of the elements), and I have reexamined in a new light some of the original data used to establish the periodicity of the elements. It is hoped that a further working out of this approach will offer a causal explanation for the electron shells and orbitals and so provide a more solid grounding, as it were, for a new quantum mechanics. The existing dogma of nuclear physics requires us to believe that protons, being all of positive charge, will repel each other up to a certain very close distance corresponding to the approximate size of the nucleus. At that point, the theory goes, a binding force takes hold, and forces the little particles to stick together, until they get too close, at which point they repel again. Thus is the holding together of the protons in the nucleus accounted for. Disdaining such arbitrary notions of “forces,” and preferring to view the cause of such phenomena as resulting from a certain characteristic of physical space-time, Moon and the author demanded a different view. 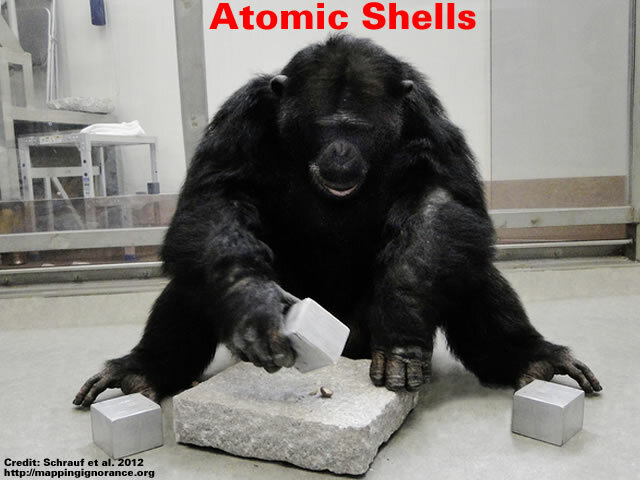 Considerations of “least action” suggested to Moon a symmetric arrangement of the charges on a sphere, while the number of such charges (protons), and the existence of shells and orbitals beyond the nucleus (electrons) suggested a nested arrangement of such spheres. Our belief that the universe must be organized according to one set of laws, applying as well to the very large and the very small, suggested that the harmonic proportions which the astronomer Johannes Kepler found in the ordering of the solar system would also be evident in the microcosmic realm, so we looked for this also in the arrangement of the nucleus. We were led immediately to the five regular or Platonic solids – the tetrahedron, cube, octahedron, icosahedron, and dodecahedron (Figure 1). Moon developed a nested model, using the Platonic solids to define the atomic nucleus in much the same way that Kepler determined the orbits of the planets of the solar system. In Moon’s “Keplerian atom,” the 92 protons of the naturally occurring elements are determined by the vertices of two identical pairs of nested solids. Before elaborating the construction of this model, let us review the properties of the Platonic solids. The five Platonic solids define a type of limit of what can be perfectly constructed in three-dimensional space. These solids are the only ones that can be formed with faces that are equal, regular plane figures (the equilateral triangle, square, and pentagon) and equal solid angles. A derivative set of solids; the semiregular or Archimedean solids can be formed using two or three regular plane figures for faces in each figure. Both species of solids can be circumscribed by a sphere, the circumsphere, such that all the vertices of the figure are just touched by the sphere. The Platonic solids are unique in that each has just one sphere, the insphere, that will sit inside, just tangent to the interior of each one of the faces (Figure 2). The Archimedean solids must have either two or three distinct inspheres. A third species of sphere, the midsphere, is formed by a radius connecting the center of the solid with the midpoint of each of its edges and is associated with both the Platonic and Archimedean solids, the cuboctahedron and the icosidodecahedron, actually are formed by the midspheres of the Platonic solids. The surfaces of the Platonic solids and related regular solids unique divisions of the surface of a sphere according to a least-action principle. In Moon’s “Keplerian atom,” the 92 protons of the naturally occurring elements are determined by two identical sets of nested solids each containing 46 vertices. Two pairs of regular Platonic solids, the cube-octahedron pair and the icosahedron-dodecahedron pair, may be called duals: one will fit inside the other such that its vertices fit centrally on the faces of the other, each fitting perfectly inside a sphere whose surface is thus perfectly and symmetrically divided by the vertices (Figure 4). The tetrahedron is dual unto itself and therefore plays a different role. The nesting of the cube-octahedron and icosahedron-dodecahedron is clear from a study of the duality relationship. However, to fit the first pair of duals into the next pair appears at first to be a problem: The 6 vertices of the octahedron do not obviously fit into the 20 faces of the icosahedron, nor could the fourfold axial symmetry of the former be simply inserted into the fivefold axial symmetry of the latter. Yet, the octahedron may still be placed within the icosahedron in a manner that is fitting and beautiful. Six vertices of the octahedron may be placed near to six vertices of the icosahedron, such that the distance from the nearby vertex of the icosahedron to the edge opposite it is divided in the divine proportion [approximately1.618] (Figure 6). The axis of the cube-octahedron pair is thus skew to the axis of the icosohedron-dodecahedron dual, and a special relationship exists at this point of singularity in the model. Note that the ratio of edges between the inner and the outer figures is in the divine proportion. Also, the ratio of radii between inner and outer spheres is the square of the divine proportion (approximately 2.618). Click the link below to read the complete article. 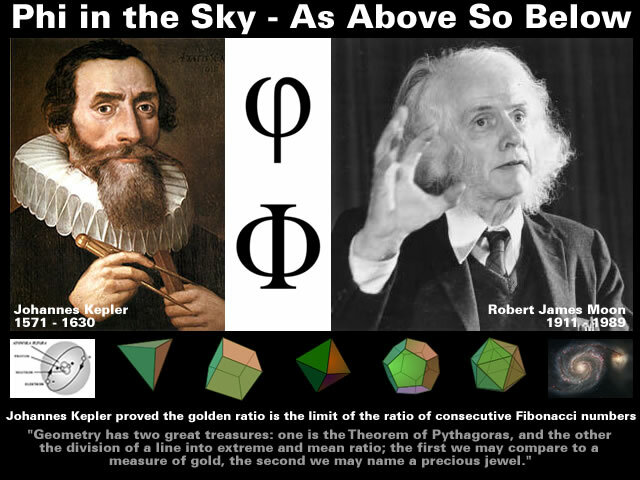 Johannes Kepler and Robert James Moon shared a common Natural Philosophy based upon Platonic Solids, Inscribed Spheres and Circumscribed Spheres which uniquely demonstrates “the ratio of edges between the inner and the outer figures is in the divine proportion” in a system which encapsulates the Hermetic concept of As Above, So Below. Additionally, the geometry of the Platonic Solids provides an interesting connection to naturally occurring crystals that are seen in the real world. Crystallography is the science that examines the arrangement of atoms in solids. 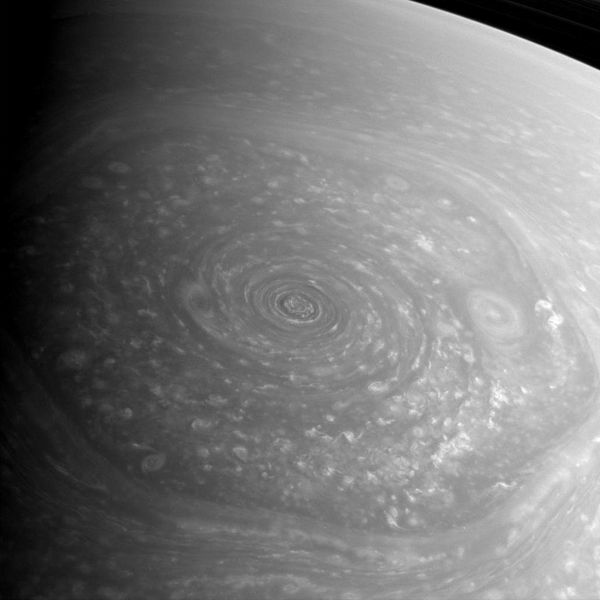 A persisting hexagonal wave pattern around the north polar vortex in the atmosphere at about 78°N was first noted in the Voyager images. Some people say the Natural Philosophy of Johannes Kepler and Robert James Moon should simply be dismissed as esoteric eccentricity. However, on the other hand, the settled science of Rutherford, Bohr, Heisenberg and Schrödinger is far from perfect and includes its fair share of esoteric eccentricities. Thank you for this amazing, wonderful lecture! 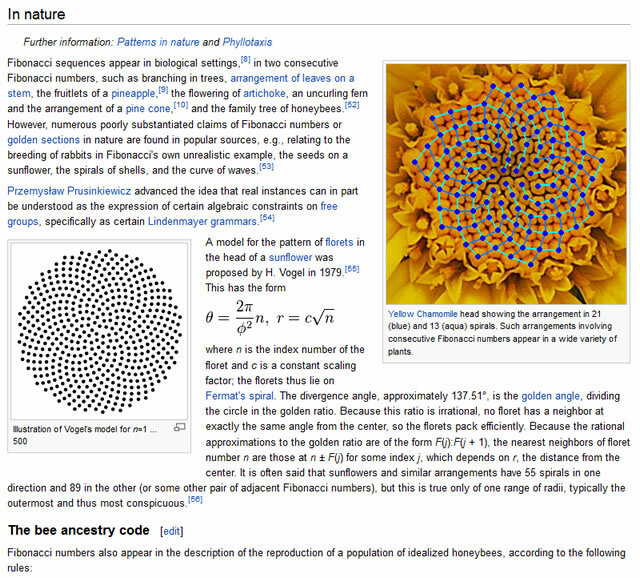 This leads one to ponder self organization in nature on different scales; Wolfram has demonstrations with his cellular automata systems in A New Kind Of Science. Similar rule systems produce similar shapes no matter of what nature the elements are. So we can use the shapes we see to deduce the rules. 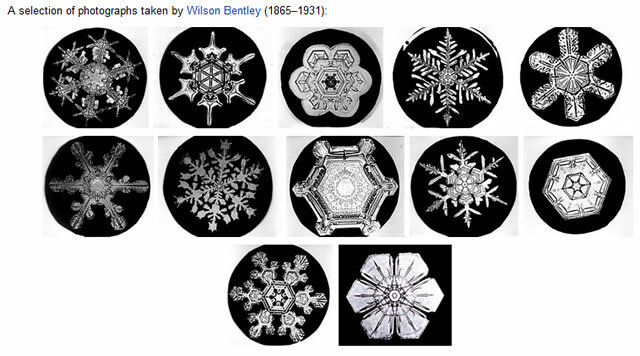 Kepler was also interested in the properties of snowflakes. You guys interested in this? and that the rhythms are those of the alignments of the Moon with Bodies of the Solar System. Husq, welcome. We’re mostly concentrating on the astrophysics implications, but interesting tidbits are always welcome. The result you outlined is the sort of thing that cries out for replication. Some extra food for thought. Does the “strong force’ that positions protons in a nucleus have a magnetic structure that follows some of the geometric patterns discussed in this article. I watched a youtube vid that is probably a bit out there but does show how a magnetic field can constrain particles along with how two spherical bodies with magnetic fields can have a relationship in an orbit situation. If the magnetic fields are also proportional as in related to the golden section, could the early solar system have been positioned by magnetic fields in relation to the body speed, mass, spin etc that could be proportional to its magnetic field. Later if the body looses its field gravity is the only force left, but it could possibly explain some form of spin orbit coupling. The real test would be all if other star systems follow this rule. Way out stuff perhaps, but the video has some interesting concepts, although a bit long and tedious. Nic: That’s an Octohedron with vertices truncated by an interpenetrating cube – right? And the more I appreciate how indebted I am to some truly remarkable observational scientists. I am also indebted to the Talkshop community for sharing their ideas and introducing me to new perspectives and connections… there is so much to discover and understand. There are numerous examples of (e.g.) 2:1 orbit ratios in exoplanet systems. That suggests mean motion resonance is a universal phenomenon, although obviously it may manifest itself in a variety of ways in different systems. I’ve seen that video before and the magnetic force demos are definitely worth a look. The video was indeed worth another look. “Least action” manifests in elegant ways. Stephen Hawking: Shades of grey mist over previously settled Black Hole theory.